А long time ago in a magic forest lived a little fairy pony. She was the princess and guardian of the forest and all of the magical creatures living in it. But one very dark night the lord of night unicorns kidnapped all the magical creatures from the forest. Little Moni is left all alone and now she must act. If she wants to survive and save her friends, she will have to run for it! But the evil unicorn lord will try to stop the little pony. He will send a stream of endless enemies and obstacles. And you must help the little pony save her friends and the magical forest. - Pony must run or fly to avoid many challenging obstacles. - The control is simple just tap to fly, tap again to fly higher. - Collect coins and power ups that will help you a lot in your journey. - With collected coins you can upgrade magical powers and customize your pony. - You control the adorable little pony as she runs and flies. - Avoid obstacles and escape angry evil unicorns, they will try to shoot you down. - Collect as many coins as you can – you’ll need them to upgrade magical powers. 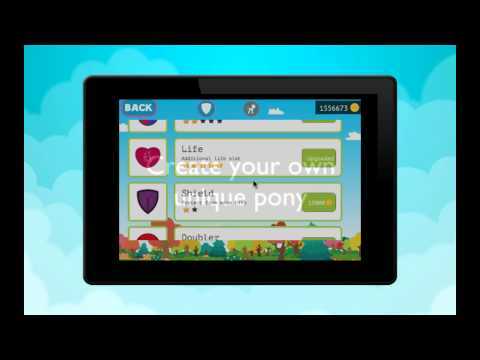 - Customize and create your own cute little pony character.